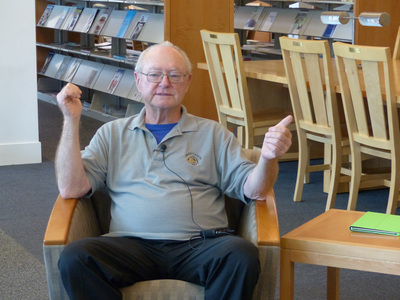 Bill Fuller is photographed during an oral history interview at the Jereld R. Nicholson Library at Linfield College. Fuller was interviewed by Camille Weber and Rich Schmidt from the Linfield College Archives. Bill Fuller co-founded Tualatin Vineyards in Forest Grove, Oregon in 1973. The company made many award-winning wines during Fuller's twenty-six years of operation. Linfield College Archives, "Bill Fuller Interview 07" (2015). Browse All Willamette Valley Oral History Interview Photos. Image. Submission 7.